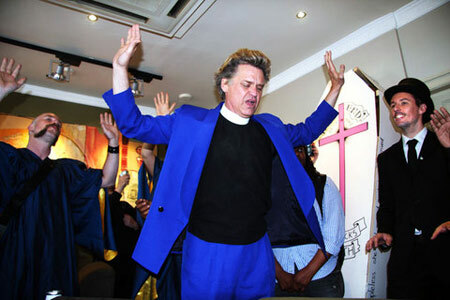 Reverend Billy (evangelical anti-corporate preacher and future mayor of New York) arrived in London to hook up with the Space Hijackers and Rhythms Of Resistance for actions and gospel concerts. With the gradual gentrification of the East End, Starbucks has spread from the city, through to it's new store in Whitechapel. 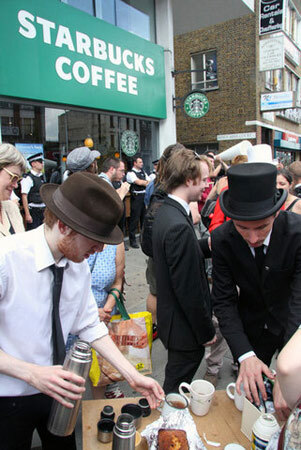 The Hijackers have had an ongoing campaign against Starbucks for years, especially the Whitechapel branch, so it was with great excitement that we hooked up with the Reverend for an action. 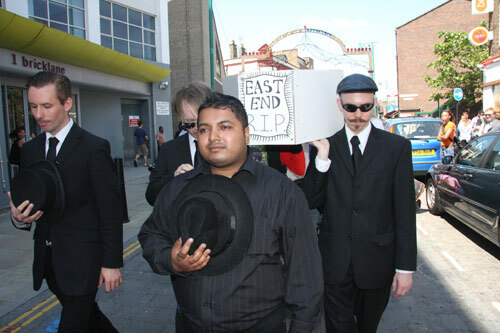 The plan was to hold a funeral procession for the East End in the light of Starbucks, Tesco's and other brands take over of our local culture. 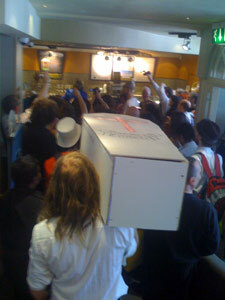 Starting at the Spitalfields Starbucks, the samba band struck up a beat and the hijackers, dressed in black, lifted our coffin and walked towards the doors. The patrons of the store looked bemused as 6 men in top hats carried a coffin in through the tight hallway whilst the deafening drums beat on. 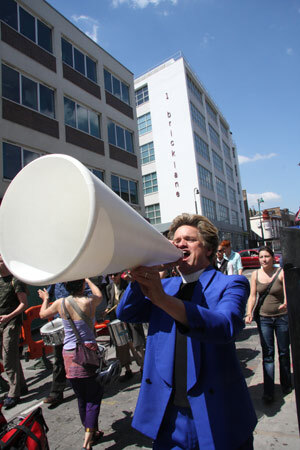 Closely following was the Reverend Billy and his gospel choir. 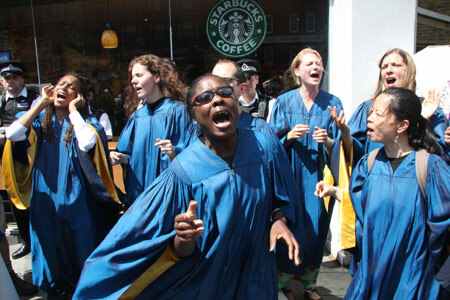 All hands were raised as he started his sermon on protecting your community from the evils of Starbucks. Before long the customers were slipping out of the door as Billy approached the tills to perform an exorcism of the demons. 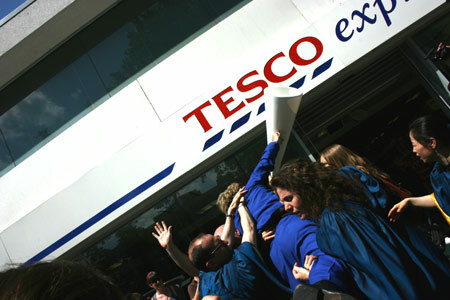 The manager was screaming at him to stop and threatening to call the Police as he fainted in true evangelical style, and was carried out over the heads of the protestors who now packed out the store. 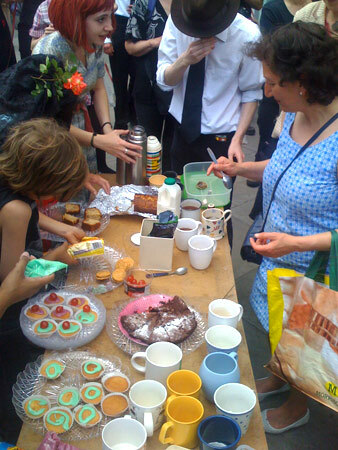 Outside, just as the police were arriving our funeral procession set off towards the 'regenerated' and 'saved' Spitalfields Market (read 2/3 destroyed, the stalls moved out and luxury boutiques moved in). The police and security tried to herd our group of around 50-60 people, but we evaded them and marched through the market with the Samba booming off the roof. 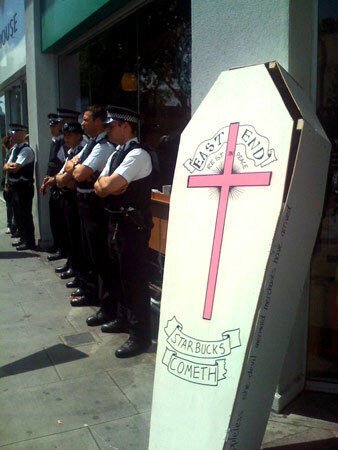 The Reverend called for no more starbucks as the choir echoed him and the Hijackers marched somberly on our coffin held aloft. Crossing Commercial Street and onto Brick Lane, we danced celebrating the small businesses and independent stores which make our community so vibrant. 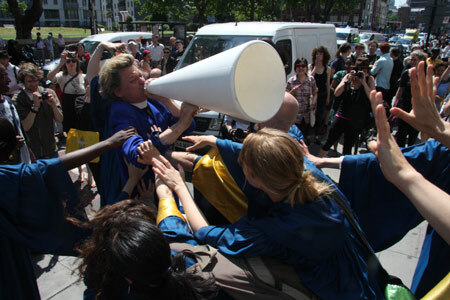 By this point we had switched from the City Police to the Met and were being followed by vans of uniformed officers. Desperate to find out where we were heading they kept asking our funeral directors which route we were going to take, only to be told to follow and find out. 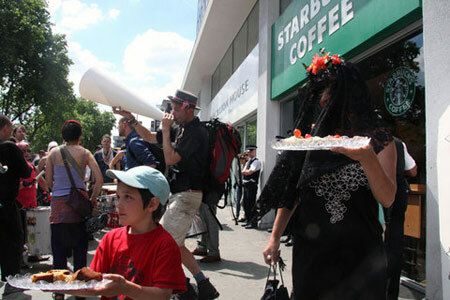 Eventually we turned left onto Whitechapel Highstreet and marched towards the Starbucks and Brand New Tesco. By this point 2 vans and 6 cars of police had camped outside the store. They had guessed it was our next target and closed down the store, kicking all the customers out onto the street (seriously guys, you do our job for us sometimes). 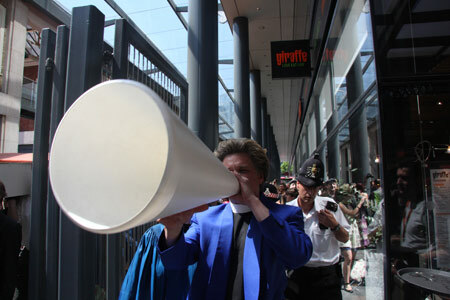 The Reverend held a sermon in the street after the police had blocked all the traffic, eventually having to be restrained by his choir from temptation, whilst Hijackers scampered off to get supplies. By the time we reached starbucks a Police helicopter was now also in tow. 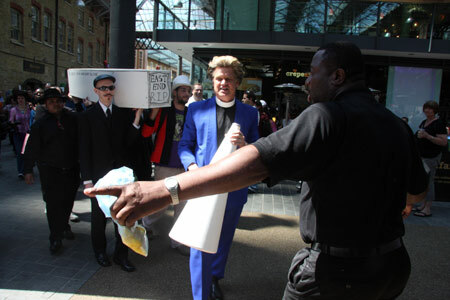 The Reverend called for us all to kick these demons out of our communities, whilst the Hijackers set up a free fair-trade tea and cake stall outside the closed starbucks and handed out leaflets on local independent alternatives to the store. Rhythms of Resistance got everyone dancing again and the street party went on.